Excellence is a standard which transcends the test of time. For over a century Red Wing purpose-built footwear has been at the spearhead of innovation in the standard of excellence for work boots. For three generations, the Gardner family has lived, worked and breathed Red Wing Shoes, right here in Central Virginia. We’re all about providing the best products with the best service, and we challenge you to find anything that even resembles the Red Wing Shoe buying experience. Around the turn of the 19th century a Red Wing, MN shoe merchant named Charles Beckman saw a local necessity for shoes specifically designed for the demanding work of industries such as mining, logging and farming. The rigors of these jobs required footwear which was tough enough to outlast harsh working conditions, but Beckman envisioned a shoe that was also comfortable enough for the hardworking people who wore them. Beckman set out to develop work boots to fill this need and in 1905 he and fourteen investors opened a company that would change the market. Beckman named his company Red Wing Shoes, and thus a new standard for excellence was born. Over one hundred years has passed since our founding and our commitment to producing only the highest grade footwear remains as unwavering as Beckman’s vision. Our products consistently perform in environments spanning from the Mideast oil fields to the Midwest corn fields. Red Wing boots protect workers in more than one hundred countries across the world, an accomplishment built by years of hard work, endurance and the promise to never compromise on our quality. Three Generations of Red Wing. Three Generations of Service. With three generations in Virginia in the shoe and work boot business, our family knows more than anyone: when you’re on your feet all day you need a pair of comfortable, quality work boots to keep your feet warm and dry. 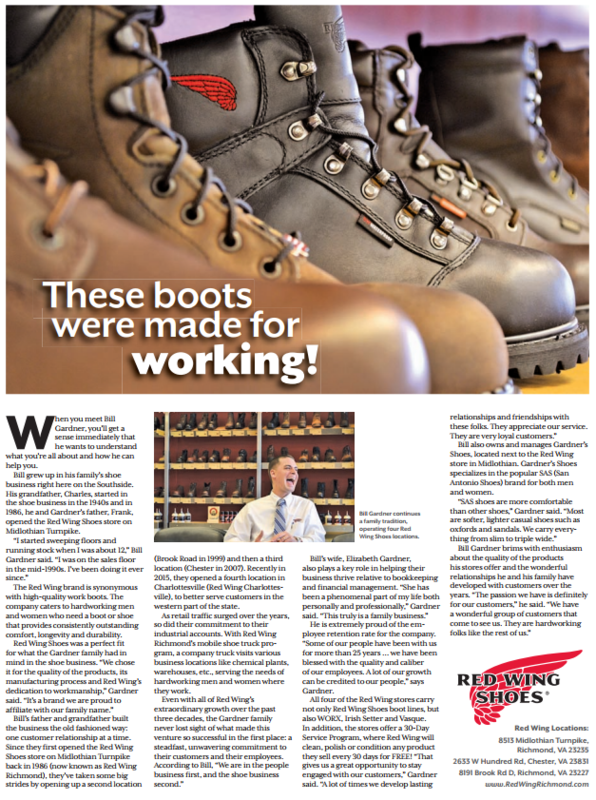 Over the years, we’ve fitted thousands and thousands of hard working folk with new Red Wing Shoes, and we’ve developed a loyal following that is the core of our business. We’re thankful for all of our customers. You are the reason we’ve succeeded over three generations. Our customers have helped us grow through the years based on our ability to deliver quality Red Wing work boots, a commitment to servicing those boots, and a focus on outstanding customer service. We kept it simple. Focus on the customer, focus on the product, focus on the service. Just about everything else will take care of itself. We take great pride in our unmatched 30 Day Service program, where we clean, polish and condition your Red Wings every 30 days, for free! All you have to do is stop and in and hand us your boots; we’ll know what to do. Our 30 Day Service program is a great example of our commitment to not only fitting you with a new pair of Red Wings, but more importantly our commitment to making them last as long as possible! We look forward to seeing you at our new Charlottesville Red Wing Shoes store, located at the top of Pantops next to Giant, right off of 64. Give us a chance to show you what owning a pair of Red Wings is all about.